Material Test & Measurement: Originally founded in 1941 by Ralph Taber, The Taber Instrument Corporation was established to manufacture precision testing instruments. As lead engineer, Mr. Taber invented numerous devices that aided in the understanding of material physical properties. Many of the original product concepts were so innovative they are still widely used today, and continue to be considered the standard for comparison in many industries. Best known for our expertise in abrasion and surface wear, Taber also offers a full product line to evaluate resistance to scratch, mar and scuff damage; along with bending and stiffness. Acquired by the Teledyne organization in 1966, the company’s name was changed to Teledyne Taber. 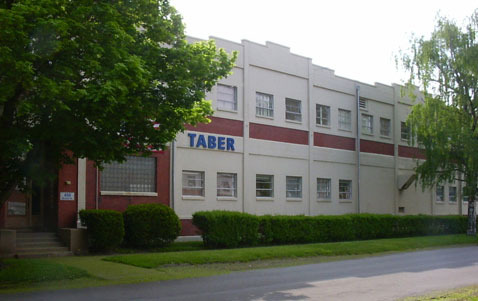 In August 1992, the company changed ownership and became Taber Industries. Transducers: In 1955, Taber’s product line was expanded with the acquisition of bonded foil strain gage pressure transducers from Frederick Flader – former chief engineer of the Curtis Wright Aircraft Company. Taber pressure measurement products are engineered for high reliability environments (space, satellite, aerospace, military applications) along with demanding industrial markets (oil and gas, marine). Our history of providing high quality instrumentation includes a 5V amplifier module used in a pressure transducer on the Apollo Space Craft and numerous programs involving life support, ground support and flight hardware for space, aviation and military vehicle applications. KENCO Press: Kenco is "The Small Press Specialist" with 50+ years of experience in low tonnage mechanical stamping presses and electrical crimping presses. Designed for applications requiring 3 to 5 tons of force, Kenco offers a rugged, dependable press for numerous manufacturing applications. With over seventy years of successes, Taber Industries continues to invest in advanced technologies and manufacturing processes. With an in-house machine shop, dedicated design and manufacturing engineers, specialized mechanical and electronic manufacturing assembly departments, along with test facilities, Taber Industries is 100% vertically integrated.